Respiratory Syncytial Virus (RSV) is responsible for many chronic conditions such as pneumonia, bronchitis, asthma, and respiratory disease. It primarily affects neonates, infants and adults and is responsible for outpatient visits, hospitalization and death in some cases. Therefore, diagnosis of RSV- associated diseases is crucial to avoid further medical severity. Symptoms of RSV presence include, rhinorrhea, cough, wheeze, respiratory distress, and hypoxemia. 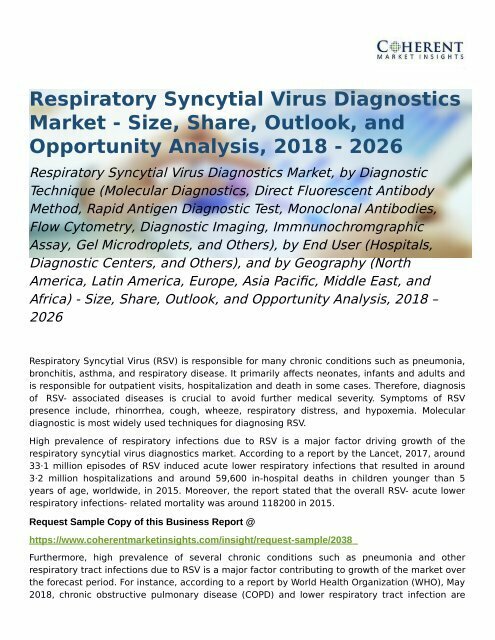 Molecular diagnostic is most widely used techniques for diagnosing RSV.